A Contemporary Approach to Classic and Comfortable Interiors. Mark Schryver's interest in interior design began at an early age. As a child he spent hours drawing floor plans and dreaming up fantasy homes. He never imagined this 'hobby' of his might lead to an actual profession, so he pursued a business career after graduating from Penn State and obtaining an MBA from New York University. 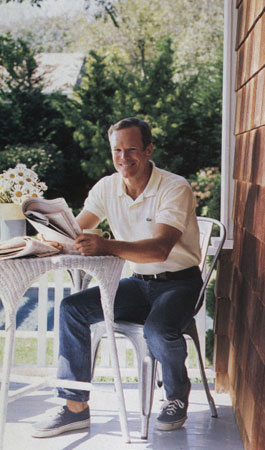 Interior Designer Mark Schryver at home in East Hampton, NY. Mark's success in his sales and marketing positions enabled him to purchase a home of his own in East Hampton, NY where he finally had the opportunity to try his hand in interior design. He immediately saw the potential in transforming a neglected 1920's bungalow into a comfortable home for his family and friends. The New York Times published a story on how Schryver converted his garage into a romantic 'summer house' in 2004. Soon afterwards, Mary Emmerling's Home Companion did a feature story on a "comfortable, quirky cottage in East Hampton". Schryver Design completed its first major project when a couple read the story and knew immediately that they had found the designer with the right mix of style and comfort they wanted in their own family home. With a keen understanding of space planning, as well as an eye for color, texture, form and style, Schryver Design has helped clients create comfortable homes that are fresh, interesting, and most importantly—reflect the personality of their owners. Clients choose Schryver Design not only for its design aesthetic, but also for its expertise in managing small and large-scale renovations. - Rooms designed to function well for everyday living. - Comfortable furniture and warm lighting. - from every vantage point. - A mix of colors and styles that are classic, but fresh. Schryver Design - 35 Sherrill Road, East Hampton, NY 11937 - All Images Copyright © 2015 Schryver Design.